I cooked three sets of spare ribs on it yesterday for a gathering in the afternoon. Learning my previous lesson, I started with about 8 coals and once ready added a chimney full of unlit ones, a bit of wood on top and poured hot water in the reservoir. The ribs in a holder took about 5 hours to cook and the water reservoir was still about 10% full at the end and I had about 40% of my coals left still ready to go. Everyone loved the ribs (my 4 year old niece ate 4 which my brother considered 'a waste of the good stuff'). All in all I was very happy. Definitely something I'd struggle to do with other methods (snake method, smokenator etc) considering how little maintenence it required (virtually set & forget save for a couple of adjustments when the wind picked up considerably). Would you be able to give me the measurement of the SnS from the underside. The top is 8.5" (see picture) I am after the opposite measurement looking from underneath. Hi, given its a while since your post about using the Slow n Sear, I'd be really interested to know if you still think it was a worthwhile investment? I've been thinking about making a purchase and have been looking at the reviews on Amazon in the US...I have a 57cm kettle and have had a few problems trying to keep a constant low temp without having to watch it and keep tinkering with the vents every half hour.... I'd like to be able to just set and leave for a few hours. Burnt2acrisp wrote: Hi, given its a while since your post about using the Slow n Sear, I'd be really interested to know if you still think it was a worthwhile investment? 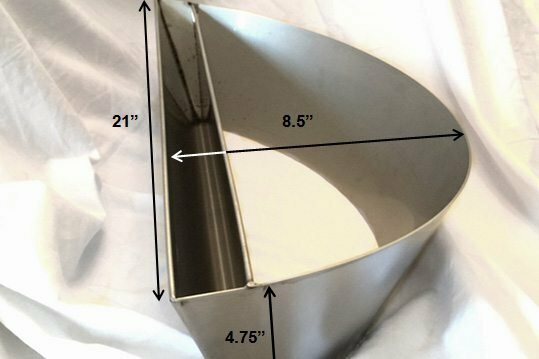 I've been thinking about making a purchase and have been looking at the reviews on Amazon in the US...I have a 57cm kettle and have had a few problems trying to keep a constant low temp without having to watch it and keep tinkering with the vents every half hour.... I'd like to be able to just set and leave for a few hours. I've done four cooks on it this year (3x ribs and 1x pork hand). Each time it's been a total success. In all the process takes about 90 minutes from lighting it to getting the desired/stable temperature. The last two cooks I didn't have to touch the vents much at all as I kinda knew from experience what to do. Now, I paid £90 for mine last year. Is the convenience of this contraption worth it? After all, I could just throw a pan of water in there and push all the coals against the side - this is still how I smoke chicken as the Slow 'N Sear seems like a lot of hassle. HOWEVER, for long cooks (e.g. the 9-hour pork hand I did today) the 'set and forget' nature of the Smoke 'N Sear clinches it for me. I work from home, so I fire it up in the morning and keep half an eye on it during the day. Regarding the 'sear' functionality, I don't use it. At the end of a rib cook, I want to sear them off but there's wood and mostly burned coals in the end. It might work, but the area isn't massive and it's much easier to fire up the gas and do it on there! I think the sear zone might work for chicken or steak but I can't be bothered using this for fast 2-zone cooking. In summary, it's a relatively expensive conversion kit that has consistently delivered. It's still fiddly to get the temp right for the first 90 minutes, but after that it's almost zero maintenance. Since I got it in August last year I've used it maybe 10 times, or £9 a meal. The stainless steel construction is such that even with my rough treatment it's not going to break, so that cost-per-meal is always going down and I can worry about other things when people are coming over for BBQ! Thanks for the really comprehensive review. I was bought one as present last week so am going to go and get myself a pork shoulder and give it a try.